Outstanding individual and group outreach efforts were recognized April 14 with the 2015 Campus Awards for Excellence in Public Engagement. The awards were presented by Chancellor Phyllis M. Wise and Pradeep K. Khanna, the associate chancellor for corporate and international relations. The awards recognize faculty members, academic professionals and students who have consistently applied their knowledge and expertise to issues for the public good. Each faculty member and academic professional receives $1,500 and a permanent $1,500 salary increase. The team award includes $5,000 to the sponsoring unit to support or enhance the project honored. Students receive $1,500 to be used for professional development or other educational activities. Mark Taylor, a professor in the School of Architecture, was honored for his untiring contributions to improve lives in Haiti. In 2010, the magnitude 7.0 Haiti earthquake left the town of Léogâne, at the epicenter of the quake, catastrophically damaged - 80 to 90 percent of the town's buildings were affected. Taylor has made many trips to Léogâne to help assess the damaged buildings. His trips revealed the enormous challenges related to building safe and resilient structures in a country where many people live on less than $1 a day. Undaunted by these challenges, Taylor developed collaborations, both internationally and locally, to improve building design, construction practices and the quality of locally produced building materials. He brought his experiences back to U. of I. students and encouraged them to engage in addressing the real-world problems of rebuilding in a very challenging context. Taylor's direct positive impact on Léogâne exemplifies true engagement. He designed and helped to construct a six-classroom school. He worked to build a midwifery-training center known locally as the Kay Fanm Yo (Women's House). Taylor listens to the needs of the Haitian communities, understands what skills and resources are available and then works with each community to rebuild with more resilience. Whenever possible, he brings this research into the U. of I. classroom, where he inspires the next generation of architects to work passionately with underserved communities. 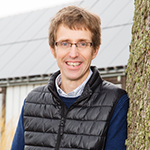 He also aims to reach a wider audience through online open-source resources and informative videos. 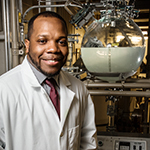 Jerrod Henderson, a lecturer in the department of chemical and biomolecular engineering, is passionate about advancing the U. of I. 's public engagement mission. In the hallway of Noyes Laboratory hangs a framed photograph of U. of I. graduate St. Elmo Brady, the first African-American to receive a Ph.D. in chemistry in the United States. Henderson has always been inspired by the photo, and he and his team named their program after the famous chemist. The St. Elmo Brady STEM Academy was created to expose underrepresented fourth- and fifth-grade boys to science, technology, engineering and mathematics, using an innovative approach. Participants engage in hands-on STEM experiments, inquiry-based learning modules and learn about STEM pioneers and inventors. In addition, fathers, male relatives or mentors attend sessions and conduct experiments alongside participants. Elementary-age boys who show interest in the disciplines are invited to participate in this program. Henderson joined the department in 2010. Since then, he has been dedicated to increasing the number of students who pursue STEM careers. He speaks to students about the keys to academic success, describing the challenges he faced during his pursuit of a STEM career. He has a passion for mentoring and believes that exposing students to STEM early will have a lasting impact on their lives and their academic pursuits. Henderson's efforts provide unique opportunities for other U. of I. faculty and staff members to become involved in community outreach activities, especially those involving minorities. 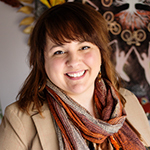 Rachel Storm, the director of the Women's Resources Center, has a passion for community, media and art. Storm's name is synonymous with volunteer work and activism, focusing on anti-violence and justice both locally and internationally. She is the founder of Four Walls and a Roof, a nonprofit organization that seeks to establish sustainable housing for survivors of violence in Cotacachi, Ecuador. In 2012, Storm founded Outta the Mouths of Babes, a youth education program dedicated to media literacy, community engagement and cultural diversity. The project invites area youth to become radio correspondents, where kids comment on social, political and cultural happenings around the Champaign-Urbana area. In July 2014, Storm spearheaded the Annual Feminist Film Festival, which screens short films made by U. of I. students. The festival drew more than 100 people to the Independent Media Center. Storm supports the YWCA Women in Leadership program and collaborates on the Hot Topics dialogue program. She was part of the recent fifth annual Ecofeminism Summit at the U. of I. The Women's Resources Center seeks to improve the campus climate for women and develop and implement programs that address women's issues and gender-related concerns. She earned her B.A. at the U. of I. in international studies/gender studies and her M.Ed. in education policy, organization and leadership. Currently pursuing her Ph.D., Storm's research examines relationships of power between the state, nongovernment organizations and grassroots feminist organizations in Ecuador. She works to build bridges where there are social divides, and she does it with exuberance and energy. Vivian Carla A. Felicio, a doctoral student in the department of curriculum and instruction in the College of Education, exudes the true meaning of public engagement through the work she does related to diversity, multiculturalism and the advancement of the education of socioeconomically challenged children. Vivian is a leader and supporter of the Luso-Brazilian Association on the U. of I. campus. She has embraced the challenge of highlighting a culture and language relatively unfamiliar to the Midwest. She has developed programs on Brazilian culture for specific campus and community audiences. She was awarded a grant from the Brazilian Consulate in Chicago for purchasing literature books for public libraries of Champaign-Urbana. She has engaged in international outreach partnerships with governmental organizations and the private sector in Brazil to improve the educational experiences of students in Brazilian public schools and to increase international relations beyond Brazilian borders. Noah Lenstra, a doctoral student in the Graduate School of Library and Information Science, is known for working in community informatics. Lenstra has worked to preserve the Katherine Dunham Archives in East St. Louis, Illinois, which document Dunham's contributions as a dancer, scholar, activist and leader in the African-American community. Lenstra has used digital technology to preserve and provide access to the history of Champaign-Urbana's African-American community. He joined community gatherings, attended church services and contacted public institutions and private individuals to assemble and place online 60,000 documents, 30,000 photos and 7,000 hours of video. As part of eBlackCU, Lenstra worked to organize both the campus and the community, and to better connect the two. He produced a 222-page monograph profiling how the U. of I. has engaged the local African-American community, both past and present. 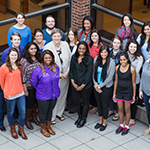 Societal impact Nicole Allen, center, a professor of psychology, is pictured with many of the students that have helped her with the Psychological Services Center Advocacy Project, which was recognized with a Campus Award for Excellence in Public Engagement. The project serves girls involved in (or at risk for involvement in) the juvenile justice system and survivors of sexual assault and domestic violence. The Psychological Services Center Advocacy Project, led by Nicole Allen, a professor of psychology, connects the U. of I. with the broader community on issues of critical social impact. The project serves girls involved in (or at risk for involvement in) the juvenile justice system and survivors of sexual assault and domestic violence. This strength-based, client-directed empowerment program connects individuals and families with trained advocates for 10 to 15 weeks to work on their chosen goals. The project is based on an ecological and empowerment approach to intervention. This approach recognizes that for individuals facing complex challenges, there is often a pressing need to change the context in which they are living and to activate and encourage existing strengths so that individuals are poised to proactively respond to their life circumstances and to pursue individual changes on their own terms. The project has provided a superb opportunity for undergraduates. The effort has trained and supervised hundreds of advocates, supported hundreds of women and girls and mobilized more than 18,000 hours of service for these vulnerable populations who are often grossly underserved by the traditional service-delivery system. The project is delivered through a service-learning framework in the department of psychology. Supervision for the project has been provided by eight graduate students: Jennifer Trotter, Sadie Larsen, Shara Davis, Emily Dworkin, Shabnam Javdani, Angela Walden, Elizabeth Trawick, Miatta Echetebu and Suvarna Menon. The project is changing lives, empowering people and improving the community.